1. A landscape designer can provide an in-depth site analysis. A landscape designer is trained to view your landscape as a system. Understanding the site before beginning the project—including wind, sun, drainage, views, noise, the location of utilities, and other important factors. Understanding your site can save time, money and heartache later on. Below are examples of the analysis of two of several factors that impacted the eventual design that I created for a Green Valley, AZ homeowner. The drawing on the left shows the drainage from the roof during monsoon rains. I calculated that in a 1-inch rain event, approximately 6,300 gallons. of water falls on the properlty. In a year with an average 11-inches of rainfall, close to 55,000 gallons of rain falls on the property. As you can see from the drawing, the water from the scuppers in the front of the house drains to the street and where it causes flooding when combined with drainage from the other houses in the neighborhood. Water from the scuppers at the rear of the house pools in the southeast corner of the back yard. This provided us with opportunity for passive water harvesting to address the drainage issues and to capture rainwater to water the landscape plants. 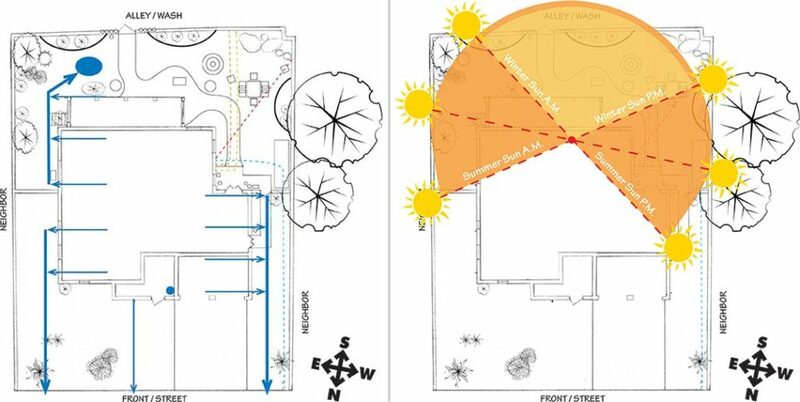 The second image on the right shows the angles of the sun during the Summer and Winter—valuable information on where to best plant new trees that could provide shade from the summer sun but leave the winter sun unimpeded to provide light and warmth on the south side of the house. 2. A landscape designer can provide a master plan to create a cohesive look. A landscape plan can help a property look its very best. 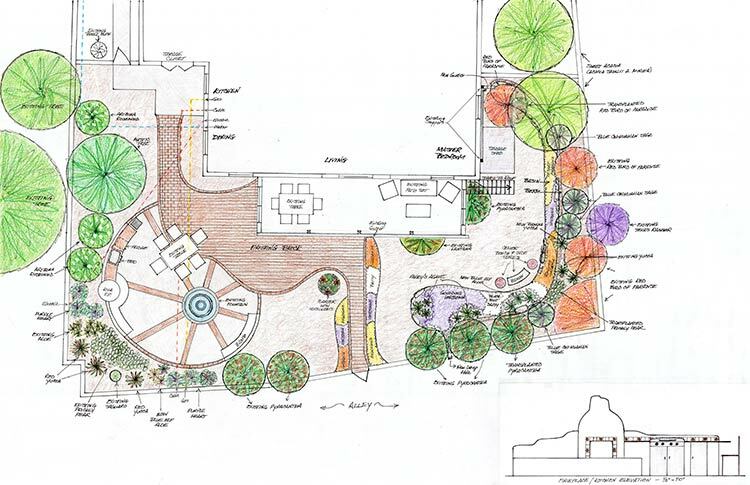 In doing so, the plan looks at more than just the plants and trees, it also addresses structural features such as lighting, fences, garden paths, fire pits and fireplaces, swimming pools and spas, outdoor rooms, terraces, decks and fountains. A landscape designer will provide you with a detailed plan that you can then present to a landscape contractor or landscaper to implement. 3. A landscape designer can save you time and money. A landscape plan will help you avoid costly landscaping mistakes. A landscape designer selects elements suited for the climate and placed in locations and in suitable relationships with other elements to ensure they thrive. This means greater success and longevity, and less maintenance and water use. A landscape designer knows where to place trees to lower energy bills. A good design not only helps you stay within budget, but it also allows you to submit the plan to various contractors to get the best value for the plan’s execution. 4. A landscape designer can increase the value of your home. A good landscape design can add value of a home compared to other comparable homes with little or no landscaping. Alex X. Niemiera, a horticulturist at Virginia Tech, compared home values and landscape design including: design sophistication, plant size (maturity) and diversity of plans. He found that a well-landscaped home had a price advantage ranging from 5.5 percent to 12.7 percent. That translates into an extra $5,500 to $12,700 in value for a $100,000 home. If resale is not in your immediate future, then now is the perfect time to put a long term plan in plan as the maturity of the plants will pay big dividends when you are ready to put your home on the market. But never fear if you’re planning on selling your house soon. Some immediate steps can be taken to give your landscape the curb appeal it needs to attract buyers. Charlene’s landscape designing ability is a masterful art of great engineering, being compatible in every degree possible as I see, with nature itself. Thank you Charlene for loving and helping Mother Earth yield its blooming natural potential in Southern Arizona homes and businesses! Kudos over and over! Thank you for your kind commments! My work is a labor of love.